Highlights include Doug Benz's "Arc of Descent/Gethsemane" and a Bob Fosse tribute. Oscar Carrillo and Vanessa Guinto in Garfield Lemonius' "Flight." continues Fri., Feb. 28, through Sun., March 2. Variety marks the Point Park University Conservatory Dance Company's annual faculty choreography production. The program, whose six works ranged in style and subject matter from the crucifixion of Christ to a tribute to the late Bob Fosse, led with Keisha Lalama's "All Together Now." Frantic percussive music by Ian Green hailed a flood of dancers as they ran wildly onto the stage. The dozen dancers then settled into a storyline in which Meg Meyer dominated her fellow performers, aggressively posturing and firing off intimidating stares as she bullied groups of them to compete against one another in dance-offs. Lalama's choreography was creative at times, but the work's outcome — in which Meyer was supplanted by another performer — felt clichéd. Following Ronald Hutson's soothing Afro-Caribbean-infused "Sand Painting," choreographer Doug Benz lent movement to two passages from the gospel of Mark in his "Arc of Descent/Gethsemane (2014)." Part one of this work, set to evening-forest sounds of chirping insects, was a moving, athletic duet performed marvelously by John O'Neill and Alex Hathaway. It referenced the biblical duality of Jesus as both a mortal son in pained struggle and as God, the father, comforting him in the face of the coming crucifixion. 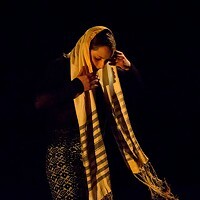 Part two featured a trio of female dancers — depicting the Virgin Mary, Salome and Mary Magdalene — watching from a distance the events surrounding that crucifixion. Benz's choreography for both sections, and the dancers' performances, were strong, but the two sections lacked stylistic cohesion. The program's second half opened with Peter LeBreton Merz's "I Gaze Upon the World in Wonder." Set to a piano score by Debussy played live by Sergey Marchukov, the ballet interpreted several images of familiar artworks, including Gustave Caillebotte's "Paris Street; Rainy Day." The technically challenging ballet included several fine dancer performances, including that of an elegant Kathryn Van Yahres. The diversely entertaining program concluded with two energetic works. 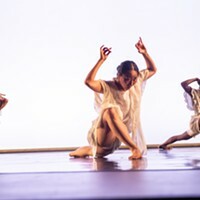 Garfield Lemonius' beautifully crafted "Flight" took off immediately with powerfully driven dancing full of twists and turns, and was highlighted by an intertwining and daring duet superbly performed by Oscar Carrillo and Vanessa Guinto. The toe-tapping "A Fosse Retrospective" ended things with a high-kicking, "jazz hands"-waving bang.